50 Computers ready to surf the web. Printing, Faxing and international calling available. $5.00 all day you can come and go as you please. 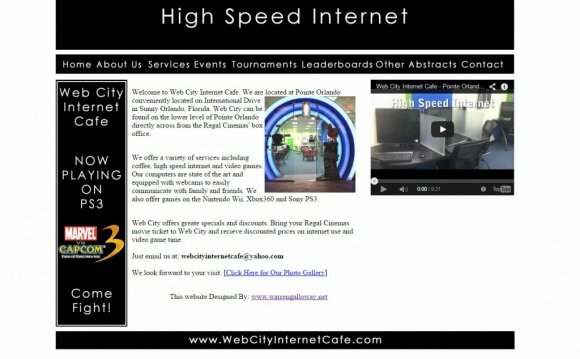 LOCATED IN ALTAMONTE SPRINGS, IT IS THE ONLY INTERNET ACCESS PUBLIC LOCATION IN NORTHERN CENTRAL FLORIDA. IT PROVIDES BUSINESS SERVICES LIKE PRINT OUTS, COPIES, SCANNER SERVICE, EMAIL SERVICE, VIDEO CONFERENCE AS WELL AS MONEY WIRES TO CENTRAL AND SOUTH AMERICA. ALSO, SHIPS CARGO AND MAIL TO ALL LOCATIONS ARROUND THE WORLD. IT IS LOCATED AT 1158 WEST STATE ROAD 436, ALTAMONTE SPRINGS, FL 327124. PR Gourmet Internet Cafe Provides Orlando Visitors and Local Residents various computer and internet services in a relaxed cafe atmosphere with delicious desserts and baking services. We are located just 1/4 mile East of SEA WORLD Orlando, Florida and about 1 mile South of the Orange County Convention Center. Will governor sign Internet cafe ban bill?